Derek made his first apple pie from scratch! YUM!!! Just one of the MANY reasons we’ve been married for so long…he bakes! I don’t bake, I cook. We make the perfect pair. Have you heard of Bountiful Baskets? You should go check it out, because it’s a great way to bring fresh fruit and vegetables to your table without breaking the bank. 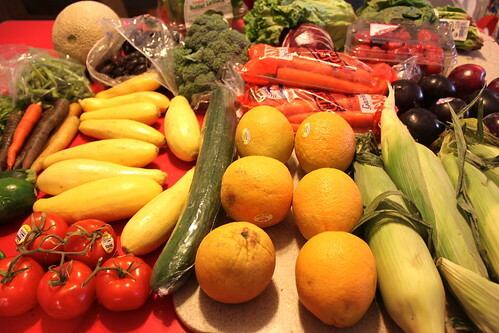 The gist of it is once a week you can buy into a share of fruits and veggies for a very low price. There are conventional baskets and organic baskets. I usually get one of each. Saturday morning you go to your local pickup site and collect your booty. 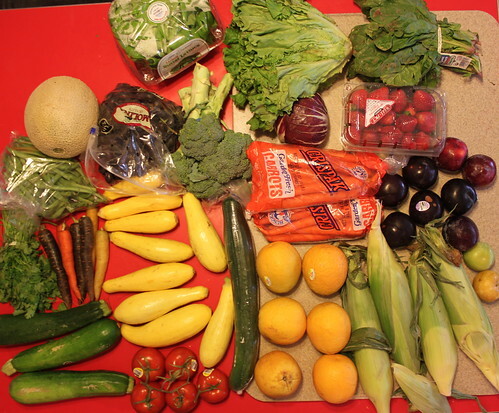 Bountiful Baskets are now available in 20 states, if you’re lucky, you live in one of them. The baskets are fun because you never know exactly what you’re going to get. We’ve tried all sorts of stuff that we might not have otherwise. 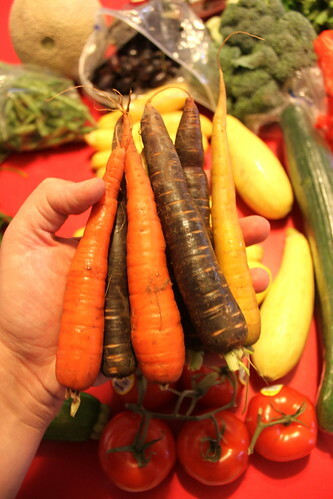 Just last weekend we were surprised with purple carrots and red corn. Here are a few shots of our take last weekend. Please excuse the bad flash photography. This is a combo of 1 conventional and 1 organic basket. Not pictured are a 2 cartons of raspberries, because they were almost immediately devoured. 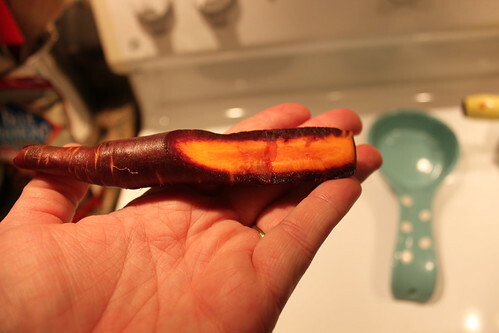 Dark purple on the outside and normal carroty orange in the middle. They tasted delicious. 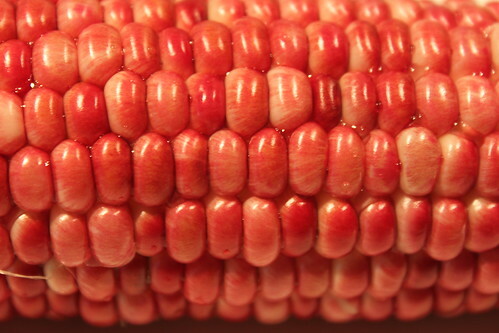 Super sweet and juicy red corn! YUM! To lessen the pressure of eating it all before it goes bad, we cut up all of the squash, carrots, green beans, and broccoli and froze them for later. That way we have a nice variety of yummy goodness ready and waiting in the freezer. I set the ones I bought on the counter to ripen for a few days. 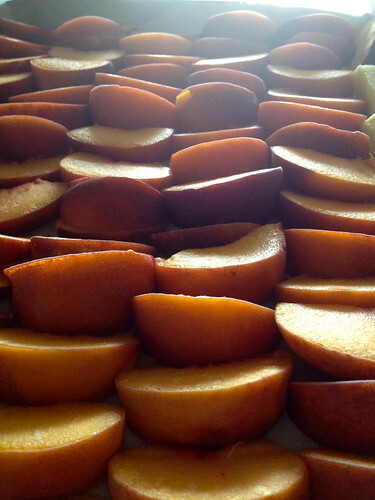 Once they were perfect and just begging to be devoured I sliced them up, put them in single layers on cookie sheets, and froze them. The next day I took them off the cookie sheets and put them in zip lock bags. 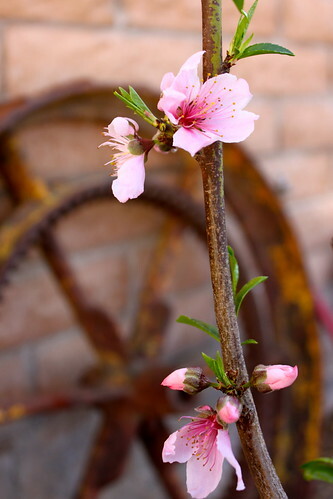 I can now reach in and grab a handful without them being all stuck together and I will have peaches long after peach season is over. 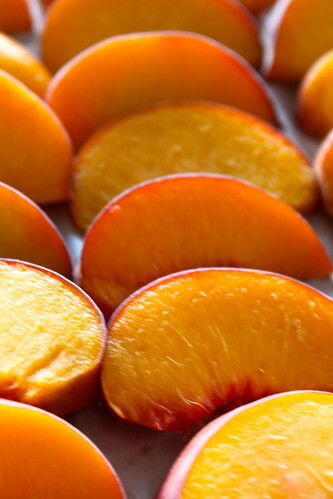 I can add them to smoothies, cereal, ice cream, eat them as is or if I am feeling like an overachiever make peach pie…which I never have and probably never will do, but I can dream. 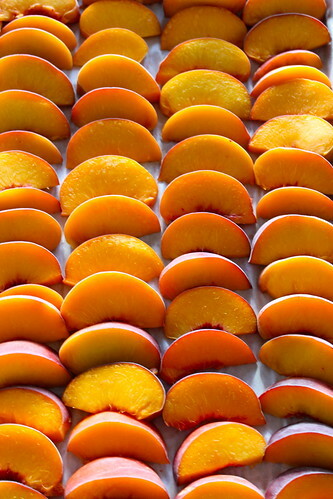 I loved the way they looked all bright, cheerful and uniform, in all their delicious peachy-ness splendor. Having a freezer full of healthy options makes me happy. Do you have any money saving, healthy eating tips? I would love to hear them! 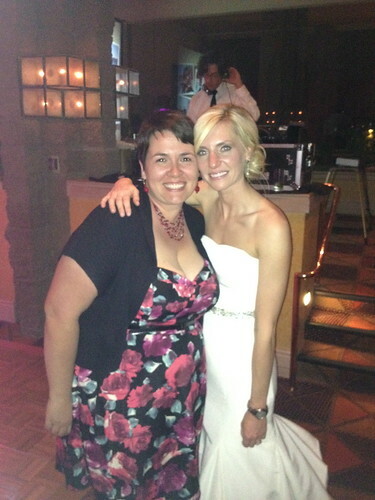 Last weekend Der and I were lucky enough to attend our dear friends Amber and Andy‘s wedding. 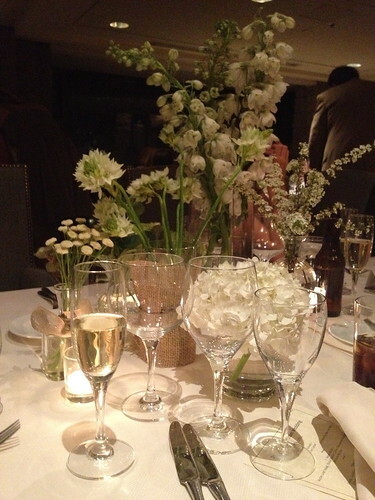 Everything about this wedding was gorgeous! 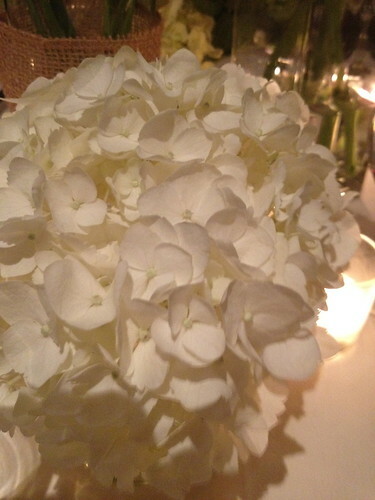 The bride, the groom, the food, the flowers, the people, the dancing were all amazing. We had the most grown up fun we’ve had in a long time. I snapped some shots on my iPhone to share with you all. 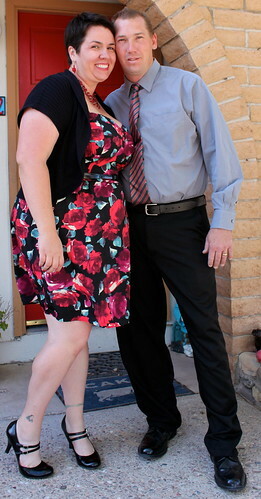 Here’s Der and I all dressed up with someplace to go. Thanks Keegan for watching your brothers and for taking this photo. This picture does not even come close to doing justice to Burr or her divine dress. Photos were taken of Burr, Andy, Derek and I together, but not with my phone so I don’t have any to share….yet. 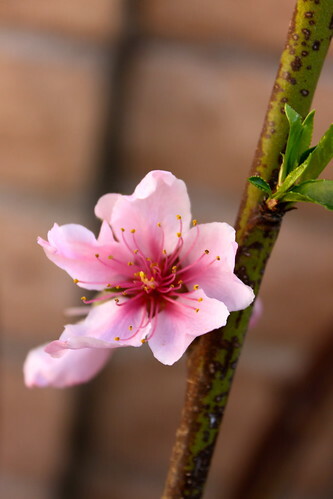 Amber said what these flowers are called, but I cannot remember. They were so pretty and perfect. I would like to draw your attention to the number of glasses. There was more alcohol served with dinner than I usually drink in a decade. Not included in this picture are the margaritas served at cocktail hour after the ceremony or the shot of tequila (yikes) I took with Andy. Needless to say I was pretty snockered by the end of the night. I may or may not have still been a touch drunk the next morning. The food! Andy and Burr both have exquisite taste, also Andy is a chef so we knew the food would be “smack your mama” good. We weren’t disappointed. 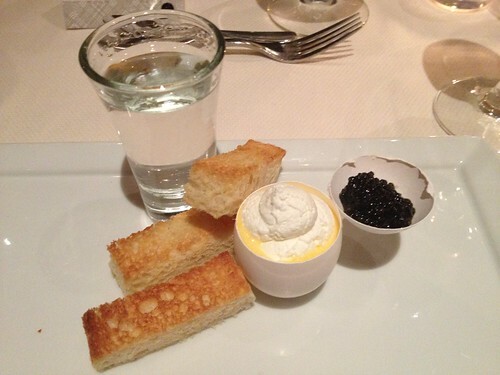 That right there is caviar served in the top of an eggshell. The bottom of the shell is full of butter and hollandaise. It was almost too beautiful to eat…almost. I have had caviar before, but it was nothing like this. This was a party in my mouth. Adding to the party was that giant shot of vodka. I think it was pretty clear that Burr and Andy had every intention of spoiling us AND getting us drunk. The second course was a divine salad that I inhaled before I remembered to take a picture. What I can tell you is that is was beautiful and delicious. We chose beef for our main course. 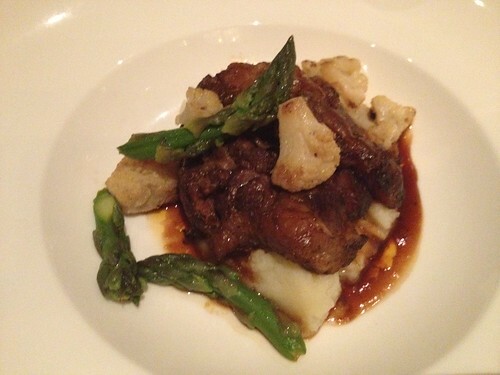 It was oxtail, cauliflower mousseline, crispy cauliflower crowned with asparagus tips and reduction sauce-as read off of the menu. All I can say is that I died, went to heaven and came back for more, after the first bite, and it only got better. And then came dessert, as if I had any room in my belly. 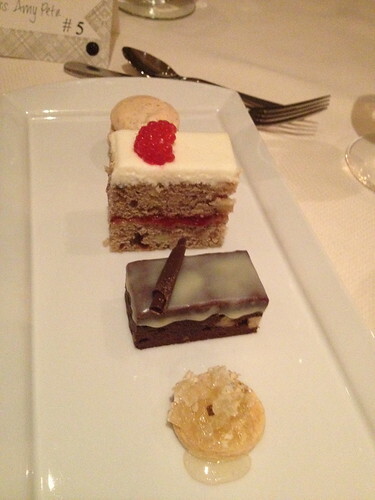 I don’t know what any of the four desserts was called, but they were fantastic. On top of all that there was a gorgeous wedding cake that I was too stuffed to taste. I think if I had attempted to eat another crumb, I would have burst right then and there, no lie. It was a spectacular evening full of beauty, grace, poignancy, and love. I am grateful for having such wonderful souls in our lives. Thank you Burr and Andy for allowing us to share in such a special day. We love you to the max! 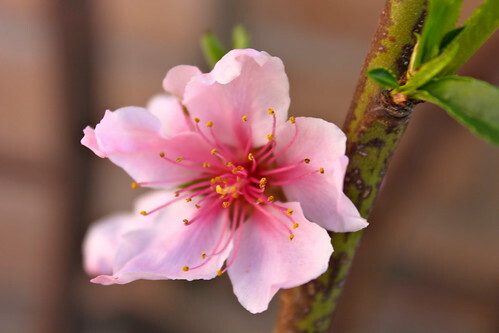 Ahhhhhh, peach blossoms, I love you so…almost as much as I’ll love eating the peaches you will bring. 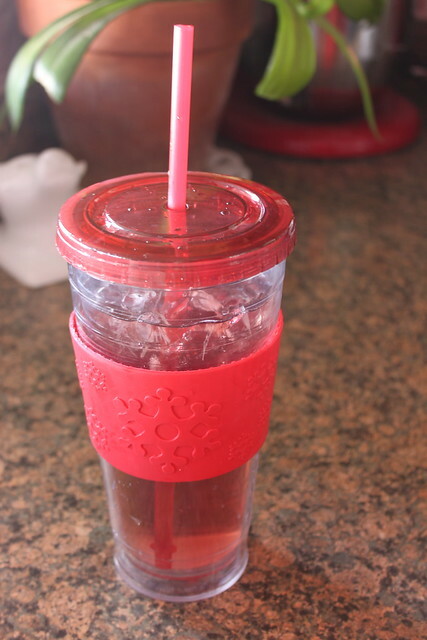 Iced Tea That Tastes Like A Blueberry Muffin?! Yes! Perfect for those days when you want a blueberry muffin, but don’t feel like chewing. You know because those types of days come along so often. Seriously though it’s a no calorie drink that’s delicious! 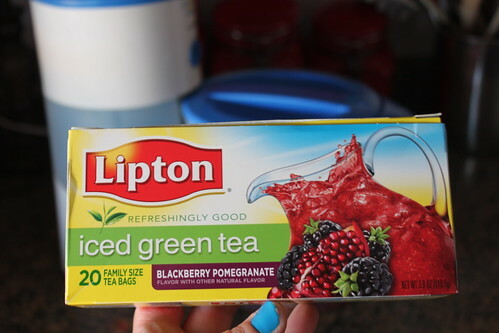 I pop two of these Lipton blackberry pomegranite green tea bags and one regular black tea bag into my iced tea maker and a few minutes later I am sippin’ on deliciousness. I don’t know why adding the black tea makes such a big difference, but it does. 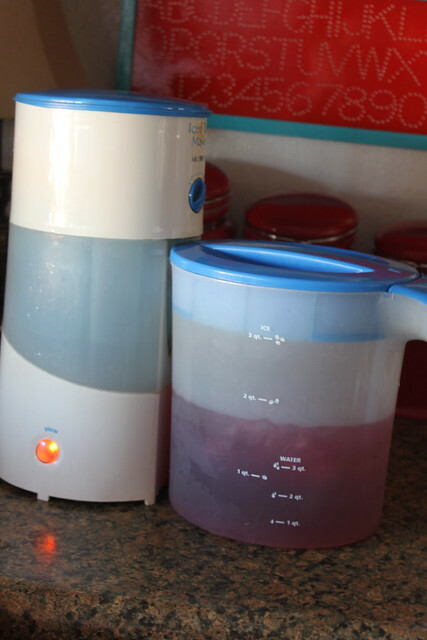 If you don’t have a tea maker yet, I implore you to get one STAT. It tastes great with no sweetener and to-die-for with a little sugar. PS. I forgot to mention that’s for 1 gallon of tea. Please allow me to introduce you to H-E-A-V-E -N.
In a big pan brown 1 pound-ish of hamburger. Don’t forget to drain it. 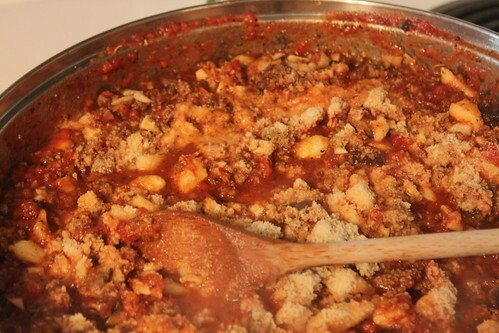 Add about a cup of grated carrots (I keep bags of grated carrots in the freezer to make things easier). 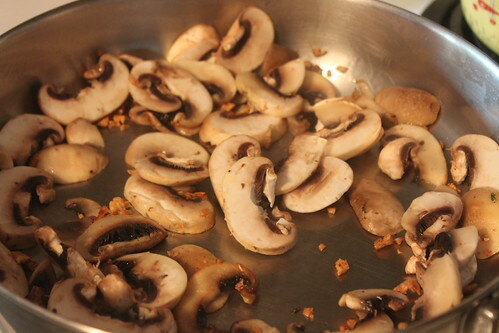 A few handfuls of chopped mushrooms (same story as the carrots). 3 or 4 cloves of chopped garlic. I love the stuff! 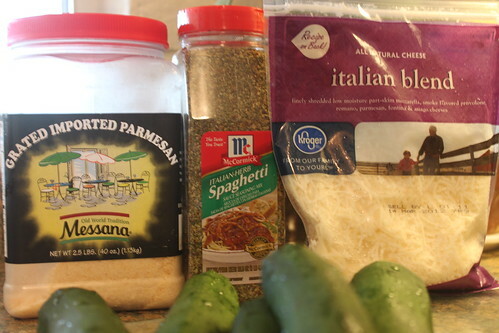 Add some italian seasonings and grated parmesan to taste. 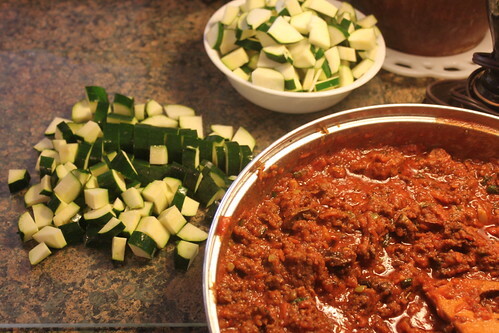 While that cooks up on medium, start chopping. 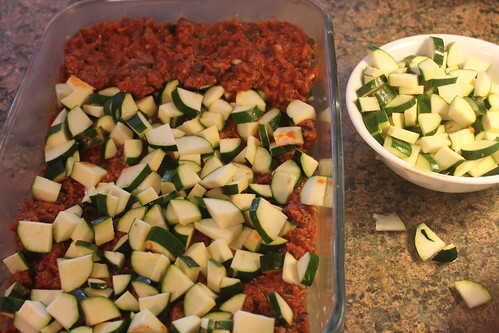 Then layer in a baking dish. 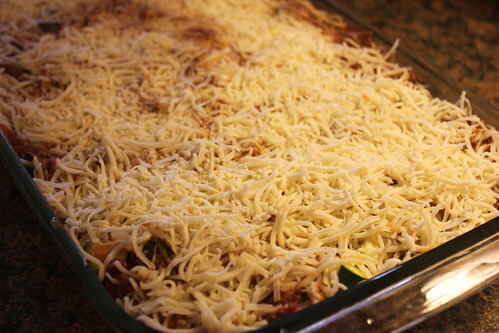 and top with a boat load of mozzarella cheese. Bake at 400 covered with foil for about 30 minutes or until zukes are tender then cook uncovered for additional 10 minutes or so. It’s even better the next day! 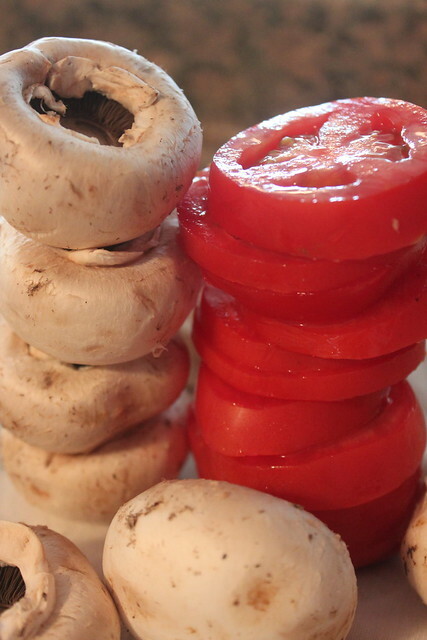 Fabulous because they are full of mozzarella cheese, balsamic vinaigrette, fresh basil, ripe Roma tomatoes, and sautéed mushrooms with garlic. 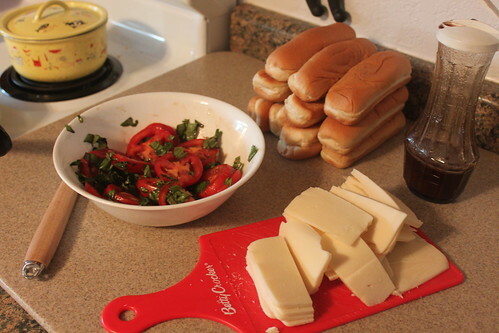 Ghetto because all of those delicious ingredients are sandwiched and melted to perfection in hot dog buns. Derek and I went to Costco last week. In our “mass consumption high,” we bought an excessive amount of hot dog buns. Sometimes I can get taken away by the bargain and forget to think about the practicality of eating say four dozen hot dog buns in the next week, because there is absolutely no way they will fit in the freezer. So Ghetto Fabulous Panini were born and we are all the better for it! 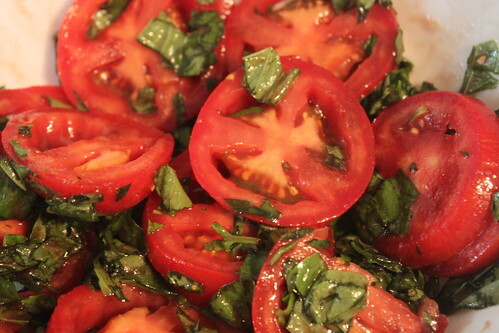 We sliced up three Roma tomatoes and roughly chopped some basil. Doesn’t the tomato in the center look like it has a jack o’lantern face? 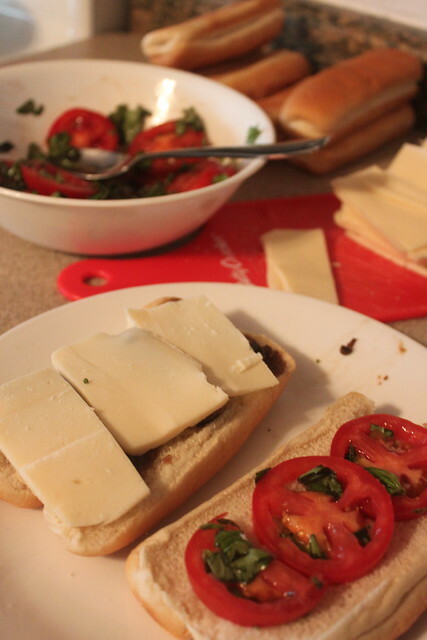 I mixed some balsamic vinaigrette in with the tomatoes and basil, while Der sliced the cheese. 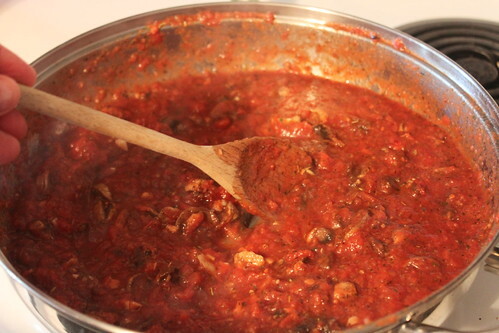 Mushrooms and garlic were sautéed in olive oil and angels came down from heaven and sang because it smelled THAT good! 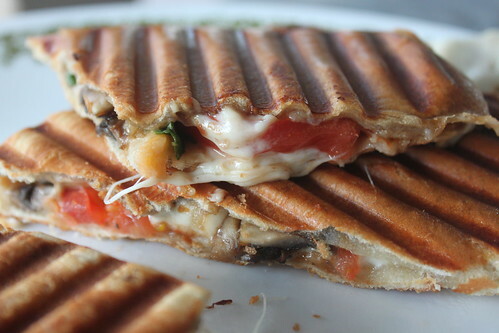 Let me just take a moment to tell you if you don’t have a panini grill, you need to get one. The boys and I got one for Derek for Father’s Day last year. I was worried because I thought it was a lame gift but he loves it and uses it just like you would a George Forman. He makes hamburgers, cheese crisps, brats, and now paninis. 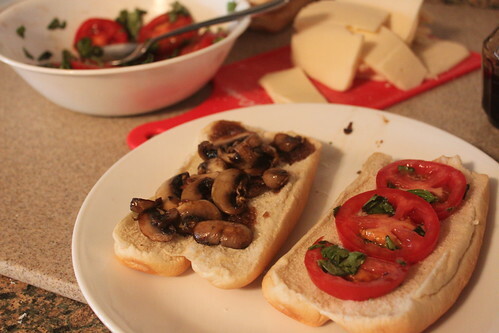 The panini grill preheated while I assembled the sandwiches. Each open bun acted as a slice of bread. I sprayed the outside of the buns with a little butter flavored Pam before I panini’d them.